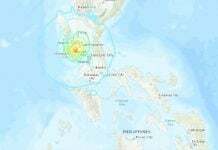 A large earthquake with a preliminary magnitude of 7.0 struck Alaska near Anchorage on November 30, 2018, sending people fleeing from buildings and to safety beneath door jambs. The earthquake shook buildings violently, cracking up walls, damaging ceiling panels and flinging items off desks and walls. 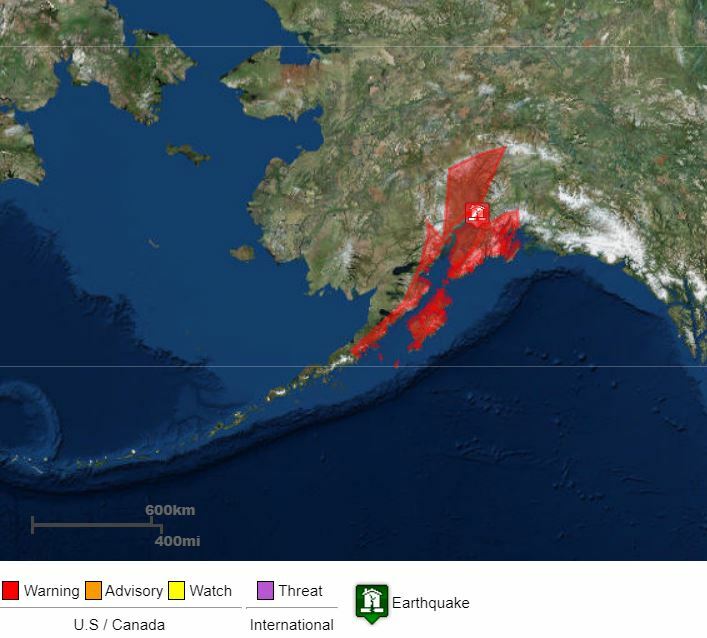 The tsunami warning center in Palmer has issued a warning for Southcentral Alaska including Kenai, Kodiak and the shores of Cook Inlet. There were reports of power and phone outages in the region. City lost power. Thought I had a flat when driving across the overpass. Bridge collapsed in Anchorage. The earthquake shook buildings violently. At Anchorage Daily News in Midtown, it sent cracks up walls, damaged ceiling panels and flung items off desks and walls, including a computer monitor and a fire extinguisher. 61.183°N 149.890°W. If you look this epicenter location in downtown Anchorage, you can find this location is on the parking lot of Alaska USA Federal Credit Union, owned by Reptilian Royals such as Bush family and Sarah Palin. 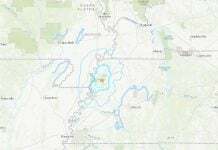 It is obviously USGS has removed it or moved the location of epicenter. But it is a strange move for USGS. If you watch Dutchsinse Channel, you can see how USGS hides earthquakes and downgrades earthquakes so often in order to avoid the attention from people. “They” do not want people to know the Earth Change is going on, right now. MrMBB33 reports actually the tremor in the center of downtown Anchorage existed! 2 earthquakes rock Anchorage Alaska -7.0 and a 5.8 in the CENTER of the city! 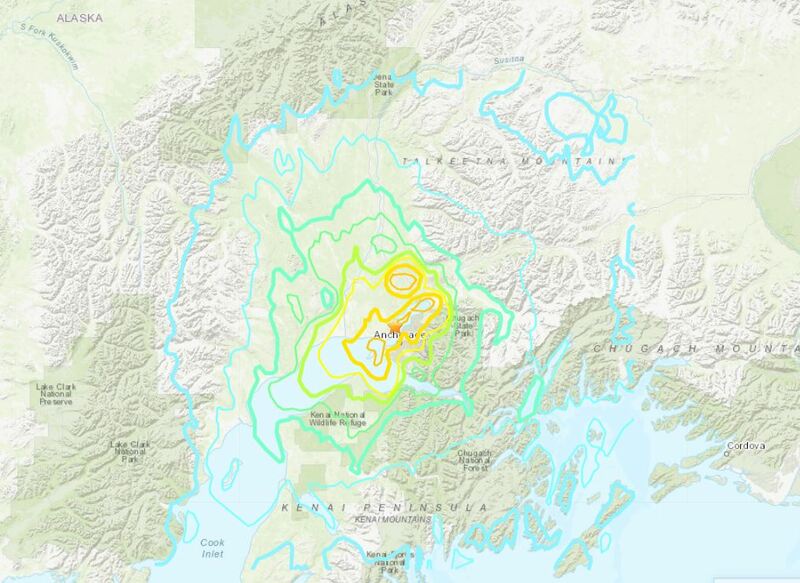 According to USGS, there were at least 16 tremors in different locations in north of Anchorage. The number of the tremors has been increased from 8 to 16 for last 20 minutes or so. But USGS has removed at least one M5.8 tremor happened in the heart of downtown in Anchorage. That means it is very possible that USGS is hiding many more tremors around Anchorage. Look at the Seismograms all over the world. Today, the Earth is so shaky! Pole shift might happen soon? Now the number of tremors increased to 41 for last 1 hour or so. This area is US Air Force (Reptilian Force) dominant area with their Secret Underground Bases. That means this area is the target area of Galactic Federation of Light. An tremor not far from Anchorage Jail appeared. The epicenter is located right on Hotel Captain Cook in Anchorage. Expect there is Reptilian City just under any city. Downtown is the surface city of Reptilian Secret Underground city. Especially, hotels and some other business buildings should have the entrances toward Reptilian Underground City. Remember, there are Reptilian cities as many as cities on the surface of the Earth. Vine Road on Google Map. You can see some kind of quarry (=entrance and construction site of Reptilian Secret Underground Base) beside this collapsed road. “George H.W. Bush dead at 94”. I feel finally the head of Draco Reptilians in the US had become dead. His death will be followed many more famous Draco Reptilians in politics and business. You can check “Deaths in 2018” https://en.wikipedia.org/wiki/Deaths_in_2018 in order to see who (famous Draco Reptilians) are dead today in the world. Their deaths will increase dramatically because of the higher vibration of the Earth. This higher vibration will be just like pesticide over those pests on the Earth. Is this coincidence? Alaskan earthquake attacks (attacks over Reptilian Secret Underground Bases in Alaska by Galactic Federation of Light) and this Draco Reptilian named George H.W. Bush’ death at the same day? He might had been hiding in their Secret Underground Base in Alaska, and he might have been killed right there! Some other Bush family might been killed, too. This is the typical death for Draco Reptilian today. Those Cannibal Reptilians are the targets of Galactic Federation of Light. This video has some houses are on fire after the earthquakes in Alaska. In Point MacKenzie where is getting so many quakes and also across Knik Arm (kind of big river to Anchorage sound) from Elmendorf AFB, has also Goose Creek Correctional Center surrounded by a swarm of tremors right now. 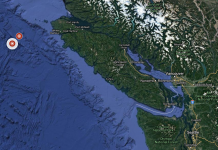 It is clear that Point MacKenzie is the strategic location where has Reptilian Secret Underground Bases now have been attacked by Galactic Federation of Light. Why there is the Correctional Center in the middle of Reptilian Underground Base? Because a prison is needed by Reptilians. They can get those prisoners as their slaves, and also they can get fresh blood and human meat from those prisoners. I tell you where Reptilian Secret Underground Base is, where a prison or prisons exist. There is a Reptilian facility (across Goose Creek Correctional Center) that has the entrance to Reptilian Secret Underground Base. Look at the street view of Google Map. This building does not have any name on Google Map. But look how they protect this facility by barbed wire fence. This building also does not have any windows. This is Reptilian fort and entrance to their secret underground base in Point MacKenzie, where is across the river from Elmendorf AFB surrounded by so many tremors. Close to 700 tremors have occurred around Anchorage, Alaska. Monument Valley has been shut down because of Global Witness’s visit. Global Witness has come to Monument Valley. Then Indian tribe shut down the whole park. Many of Youtubers (hired by Reptilian Organization) made this “Global Witness” a bad guy. I have checked myself about this Global Witness, and found out that Global Witness is the organization to protect environment and human rights. Why Global Witness is in Monument Valley? Because they have found some injustice in that park or the Indian tribe managing the park. Many Indian tribes fall into the traps of Reptilian Organization, Illuminati because of their need for money. As you see in Google Map, you can see so many mining activities and quarries in many Indian Reservations. This is NOT a coincident. Galactic Federation of Light attacked and cleaned up Reptilian Secret Underground Base near Buenos Aires when all the Reptilian presidents gathering there from all over the world. Very soon, G20 meeting will be canceled and disappeared. No more Reptilian talk behind their curtains (=G20 meeting). 4 star hotel, Howard Johnson, in the middle of nowhere, near epicenter of this G20 Summit quake. This hotel has 2 hearths to cook human children (see the images of Google Map). I cannot find news about Alaskan earthquakes on the main page of CNN, now. I cannot find new images from Anchorage area at all. What I found were all the same images came out yesterday. This is kind of media blackout on Alaskan earthquakes? “They” really like to hide these tremors in Alaska because these tremors are NOT really earthquakes, but Galactic Federation of Light is cleaning up Reptilian Secret Underground Bases that causes the tremors.